Former Prime Minister Nawaz Sharif and Pakistan Peoples Party (PPP) Chairman Bilawal Bhutto met at Kot Lakhpat Jail. The Bilawal Nawaz meeting held today at the Kot Lakhpat jail. 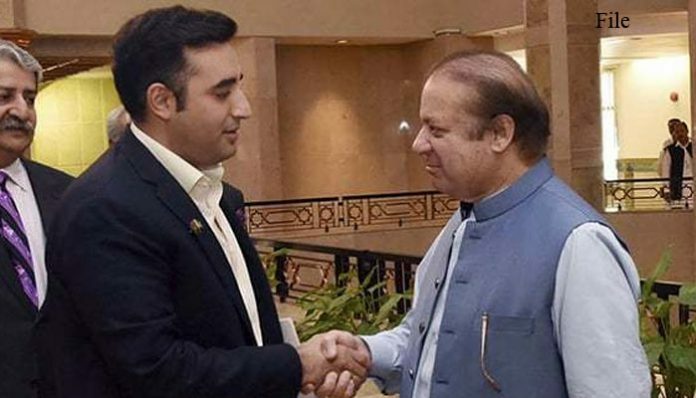 Bilawal Bhutto Zardari inquired about the health of PML-N chief Nawaz Sharif. However, senior PPP leaders including Mustafa Khokhar, Jameel Soomro, Qamar Zaman Kaira, and Hassan Murtaza also accompanied Bilawal Bhutto. Qamar Zaman Kaira filed a request to the Punjab home department on behalf of Bilawal Bhutto Zardari to meet Nawaz Sharif today. Earlier, Bilawal Bhutto Zardari asked permission to meet Nawaz Sharif in Kot Lakhpat Jail to inquire about his health. PM Imran Khan on Saturday asked CM Punjab Usman Buzdar to ensure that every health facility in the country is made available for Nawaz Sharif to get the treatment of his choice. Nawaz Sharif has been imprisoned at jail since December 2018 following his conviction in a corruption reference in line with the Supreme Court’s July 2017 decision.